Almost everyone who comes to Ullared comes by car or other vehicle. In order for the traffic to flow smoothly, we have therefore placed our reception for cabins and camping along road 154 on Falkenbergsvägen 21. Check-in for hotel and motel guests is done directly at the reception at the hotel. When you arrive, you need to have your reservation number ready. All payments are made online or on arrival. To save you queueing on your day of departure, there are red fast checkout boxes in a number of locations in Gekås Village. You can use these to deposit your key or barrier pass as you leave for your next destination. 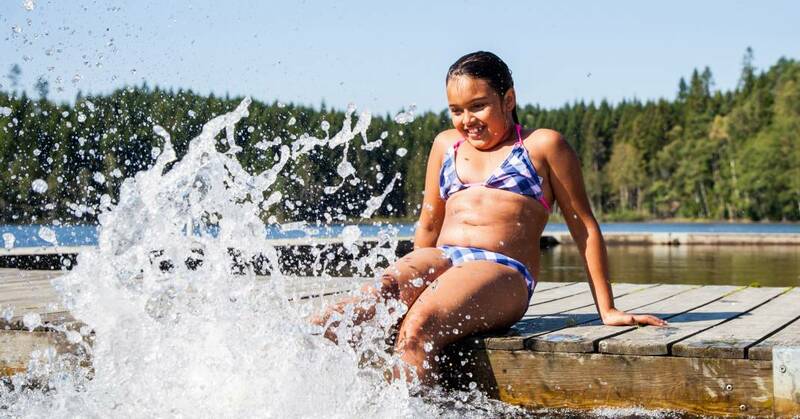 Musasjön Lake in Ullared has a bathing area, toilets and a walking trail. To walk there you can take the footpath over the hill through the wood. 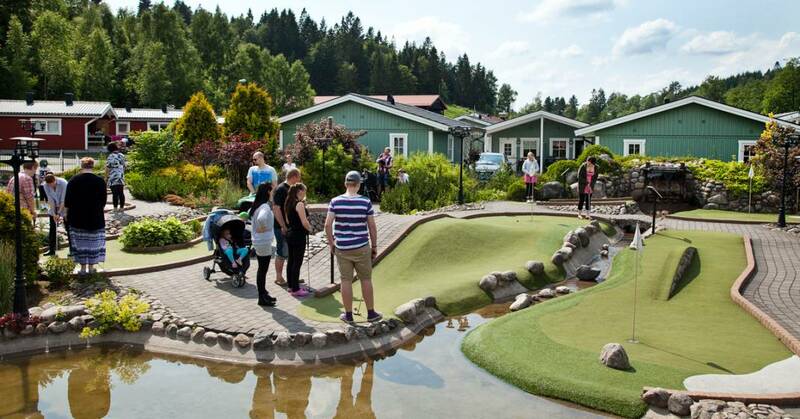 Most families choose to stay in a cabin because they can park their car directly outside and the minigolf course, high ropes course and play area are just a stone’s throw away. And inside the superstore itself there’s the Play Centre. 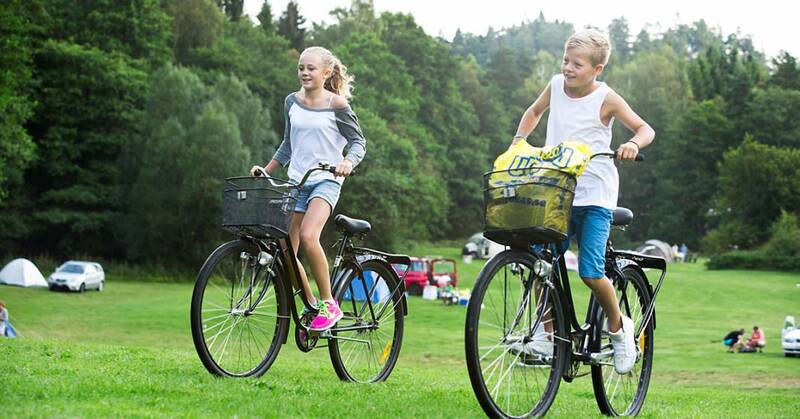 Here the kids can let off steam by climbing, cycling, sliding and having fun while the parents have a well-earned rest. All payments are made online at the time of booking, if you book by phone, the booking can also be paid on arrival. We would like to see you paid before arrival, saving a lot of time at check-in and creating shorter queues. If you are unable to check-in during our opening hours, please let us know that your stay is prepaid. The hotel only accepts payment by credit card. The campsite shop is located at the heart of Gekås Village. It sells newspapers, sweets and ice creams and any breakfast essentials you may have forgotten to bring with you. It also offers a selection of takeaway food and you can order breakfast, pizzas, 3-course meals or party platters, for example. Caravans must be parked in compliance with the applicable fire regulations. An information sheet is available in Reception. Only one car per pitch is permitted. Temporary visitors can park in the visitors’ car park outside the campsite. To get to your pitch you will need a barrier pass for the barriers. The box for electricity and TV is open and is free of charge. Access to the service blocks and the associated facilities is included in the cost of your stay. Bikes can be rented from the campsite shop. The shop also has a map with suggestions for cycle routes in the area. Please barbecue with care and at a sensible distance from flammable items. You are welcome to use our designated BBQ areas or to grill your food on our BBQs. Here you can surf the net at your leisure. Connect to Destination Ullared. You don’t need to log in and it’s completely free! There are trolley parks by the superstore, in Gekås Village and outside the Hotel and Motel. Please return your trolley to the designated area. For safety reasons, trolleys must not be taken into any of the accommodation.This is to ensure that the accommodation can be evacuated rapidly in the event of a fire. Also, the trolleys have fairly sharp edges which could damage walls and furnishings. Please make sure you don’t leave anything behind after your stay with us. We cannot be held liable for any items which you may have left behind but we will endeavour to ensure that the items are returned to their rightful owner. Please let us know within 1 week of your departure at the latest if you have left something behind. We want everyone to get a good night’s sleep and to wake up refreshed and ready for the new shopping day. Consequently, quiet time in Gekås Village is from 11pm. If you are disturbed by noise please call night patrol on +46 (0)10-470 51 06. If you need to contact us, our reception is located at Falkenbergsvägen 21 on Road 154. And clearly you can also call us on +46 (0)346 375 01. Please note that smoking is forbidden in all buildings, rooms and cabins. If you fail to comply with this requirement, you will be charged for the cost of cleaning. Sometimes the car park by the superstore is extremely busy. So, to make things easier for guests staying in our accommodation, in high season we run our own shopping bus. It’s convenient and environmentally friendly. Cleaning is not included in the price. Please make sure that you clean the accommodation thoroughly so the next guest can enjoy their stay as much as you. There will be an extra charge for cleaning if needed. You can hire bedlinen from reception for SEK 60 per set. Otherwise, you can find most things you need in the campsite shop or the superstore.